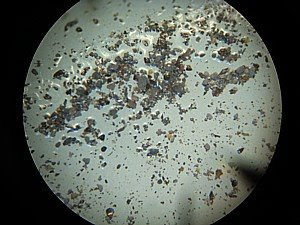 The vast majority of the material appears to be non-metallic junk (silicates, carbon, or whatever). I was able to see only a couple of very tiny magnetic bits using a magnet. You would never have seen them move with the naked eye. I next did a trial of drano with some aluminum filings so I'd have something as a reference. Bubble and fizz as advertised.I then applied the drano solution to the washings. I was able to locate only 2 or 3 microscopic fizzies out of the whole lot. Not much aluminum in there. 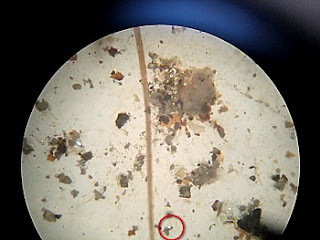 What is notable, and you can see it in the photo immediately above, is that there is a scattering of metallic looking particles (red circle).These are mostly the width of a hair and smaller. They are not aluminum and are not magnetic. They have the appearance of microscopic bits of aluminum foil as you can see.Plating of some kind? Any thoughts? Know anyone crazy enough to look at their filters this closely? I hope your not tiring of this! A little more... Re-reading your metals analysis post, I proceeded to look at the effect of HCL on the debri.I tried 25% HCL first with very little observable effect. I then went to 100% HCL. At this concentration, the tiny shiny bits were clearly seen to bubble and begin to dissolve. No green tinge was seen anywhere so I doubt chrome. There is no blackening seen either. Based on your post, I'm guessing tin. So, I would characterize this as scattered, microscopic platelets consisting of tin. Question is, is this a matter of concern or a normal wear finding? Any opinion? As I said, I will send the next filter out and see what the professional lab has to say. I thought this was a professional lab! Your microscope looks familiar - just like mine! 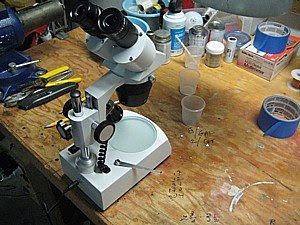 A good bench microscope is a handy shop tool. Now that I'm older I use it to read tiny part numbers off of parts. Your sample looks very clean. If you have blow-by of combustion gas past the rings, the sample will be darker with more flakes of black carbon. On turbocharged engines the filter paper will be almost black and brittle. What I used to do was to squish all of the debris between two microscope slides. If it squished with no scraping sound - good - no sand or rocks. If it scraped, scratched, and made noise then I had some sand particles - time to check the induction system for leaks; or stop pulling out the alternate air door on run-up if the runway was dirty! If your tiny bit of shiny metal is brittle then suspect chrome, otherwise tin if it passes the drano test. Either way one microscopic bit is not important. I would use a stick magnet to collect all of the bits of iron. Usually they were not shiny and looked like iron filings that you collect from dragging a magnet in sand. If they encircled the tip of a stick magnet then there was cam or cam follower problems. If less, then everything was OK.